New Caledonia celebrate Emile Ounei's goal. After 90 minutes of enthralling football, New Caledonia have edged ahead of Fiji to win 2-1 and close out their 2018 FIFA World Cup Russia™ Qualifiers – OFC Stage 3 campaign on a high at Stade Numa Daly in Noumea this evening. 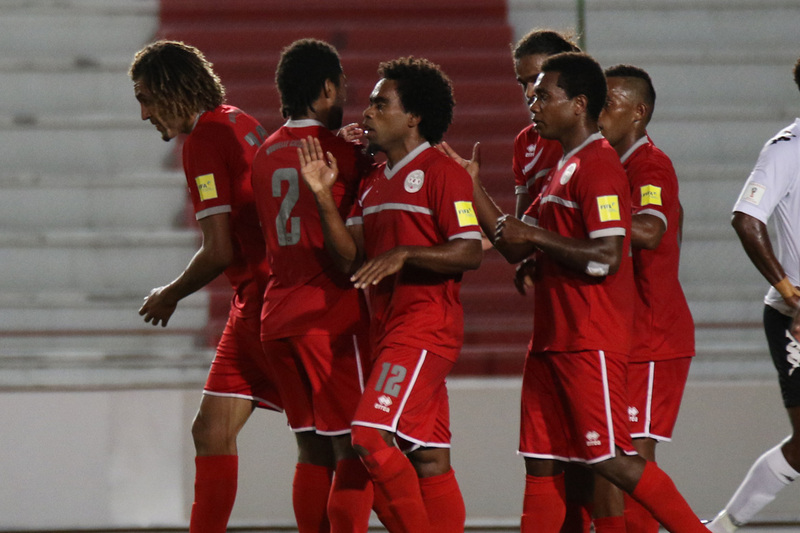 Although the Francophones dominated possession for the majority of the match, impressive defending from Fiji kept New Caledonia at bay until the 43rd minute when Emile Ounei found the net from the penalty spot following a handball from Kavaia Rawaq. After a double substitution early in the second half brought senior squad members Roy Krishna and Dave Radrigai to action, Fiji lifted intensity and looked more confident to score the equaliser. Epeli Saukuru was the Fijian to find the net, throwing his body in front of a cross and sending the ball past Mickael Ulile. However, the Bula Boys celebrations were short-lived. New Caledonia fought hard to regain their lead, putting goalkeeper Tevita Koroi and the Fiji backline under more pressure and setting Richard Sele up to score the winner only six minutes later. Krishna proved his worth on the field, testing Ulile several times throughout the remainder of the match, but impressive judgement from the goalkeeper – and fast counter attacking from Roy Kayara and Mone Wamowe – left Fiji fighting in vain for another equaliser. New Caledonia coach Thierry Sardo was overjoyed with the positive result and pleased to see his side prove more competitive since their previous encounter with Fiji. “I am very happy because we performed at the same level that we played in the first 30 minutes against Fiji in the last game, and today we managed to win. All the players did what I asked of them,” he said. Although Fiji coach Christophe Gamel was disappointed to lose through a penalty, the Frenchman was very impressed with the quality of football from both teams and proud to see his side fight from the starting whistle. “It was a good game. High intensity, technically well-played, and both teams wanted to win this game which made it really interesting,” he said. “I’m disappointed about the result – we deserved the draw because we really pushed at the end – but we shouldn’t be ashamed about the score. We did well, we applied our plan and we were a tough team from the beginning of the game for New Caledonia.